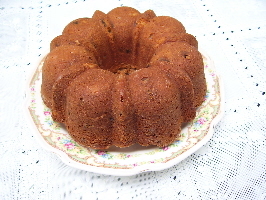 Sour Cream Coffee Cake Recipe baked in a Bundt Pan is irresistible with butter, sour cream, golden raisins, pecans, and cinnamon. 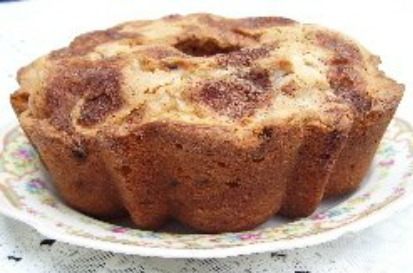 This was my best cinnamon coffee cake when I was baking and selling homemade baked goods in the 1960s and 70s. Customers learned what time of day I delivered these warm cakes, fresh out of the oven. They would be waiting for me at the store when I arrived and others would be placing orders on the phone. Add sugar a little at a time, creaming after each addition. In a separate bowl, sift together flour, baking powder, salt, and cinnamon. Add nuts and raisins to flour and stir to coat well. Fold flour and sour cream into batter alternately, a little at a time, starting with flour. The batter will look like whipped cream tinged with honey. Pour into a greased and floured Bundt or tube pan. Sprinkle top with 1-1 1/2 teaspoons cinnamon sugar. Bake in a preheated oven 350F. for 50-60 minutes until done. To test if done, stick a wooden toothpick or small knife into center of cake. The crumbs should be dry and the cake golden brown. Remove from oven and let cake sit for one hour before removing from pan. To remove cake, loosen edges and turn out upside down on a rack to continue cooling. Make three cakes at one time. Double the recipe and pour into three (6 cups) Mini-Bundt pans. Reduce baking time to 45-50 minutes. Cakes may be frozen. Cool thoroughly before wrapping and freezing. Reheat in microwave if you prefer to serve this awesome cake warm. *You can purchase Cinnamon Sugar in the spice section at the grocery store or make your own. To make your own, mix together 3 tablespoons white sugar with 1 teaspoon ground cinnamon. Place in a spice jar with tight fitting lid and store in a dry area. When making this Sour Cream Coffee Cake for gifts or a bake sale, wrap it in cellophane paper instead of plastic wrap for a more professional look. It also makes attractive gifts from the kitchen, by cutting the cake in half before wrapping, exposing the attractive and delicious interior.